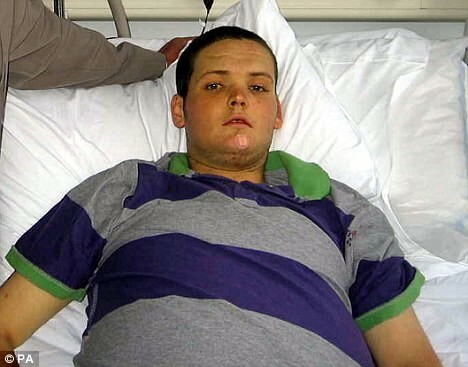 Gareth Anderson destroyed his liver over a binge drinking weekend and now needs a transplant to survive; but NHS guidelines prohibit liver transplants to patients without 6 months of consecutive alcohol abstinence. Gareth’s father is fighting in the courts to save his son and Britons are again faced with the tragic consequences of a very big national binge drinking problem. Only a couple of weeks ago Britons debated organ transplant guidelines after reading the story of 22 year old Gary Reinbach who was denied a liver transplant, and so died of alcoholic cirrhosis. Now, a 19 year old out of Ulster Northern Ireland, Gareth Anderson, lies in King's College Hospital London, suffering from total liver failure; the result of a mammoth binge drinking session over the first weekend of August. Doctors say that without an organ transplant the teen will die within 2 weeks, but according to transplant guidelines which prohibit the consumption of alcohol for 6 months prior to a transplant, he is ineligible for the transplant waiting list. Anderson become ill after downing 30 cans of beer over a weekend binge drinking party. Because available livers for transplant never meet demand, the National Health Service (NHS) has adopted certain guidelines that help doctors with the impossible task of determining which patients get lifesaving operations and which patients don’t. Family members had pressured Northern Ireland Health Minster, Michael McGimpsey to act on behalf of Gareth, but McGimpsey indicated he could not intervene in a health matter that required the professional judgment of doctors. The requirement for 6 months of abstinence is only a guideline, and one that doctors can overlook, but an NHS Blood and Transplant Department spokesperson defended the use of the guideline saying, “it (the 6 month guideline) is one that has been adopted following publication in medical journals from various doctors who have recommended it as suitable practice. It is recognized and in use around the world." The spokesperson said that although doctors can disregard the guideline, that they must also, “take into consideration other potential liver transplant patients who are waiting as well." Dr. Roger Williams, a UK liver specialist, has weighed in on the public debate over the boy’s case, saying that 6 month guidelines should not apply in cases like this. Brian Anderson says the he feels optimistic about getting Gareth onto the transplant waiting list and says that his son is “doing well” in hospital.